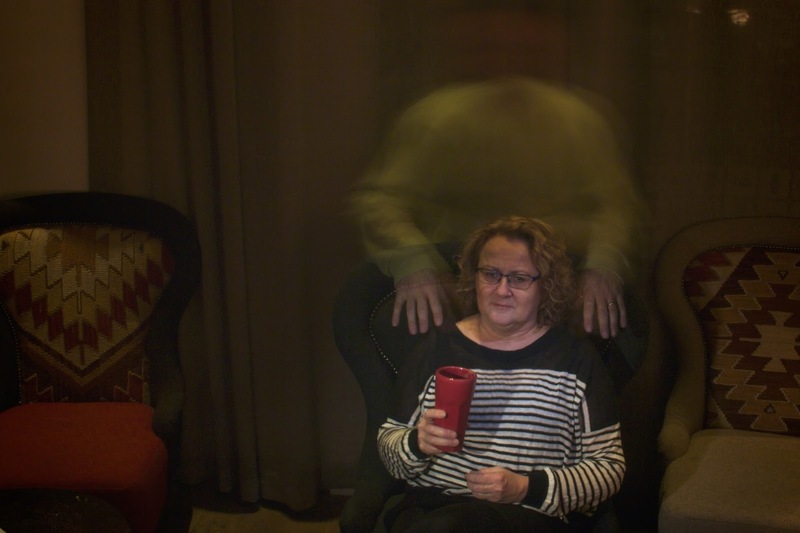 Teamwork: Sinikka Eriksson has a large mug of coffee while a ghostly Ulf Bodmar sneaks up. Stefan Kroll pressed the camera trigger, while Akram Ahmet and I handled flashes with snoot and speed grid. Shutter time: 4.0s, f/22. It's a simple idea: Use Facebook and Google+ to bring a group of photography buffs together, and use whatever we bring, or can find on the premises, to experiment and learn. The idea was born during a very rainy Drink-and-Click meeting some months ago. We hid from the rain in a restaurant, and everyone sat and did nothing, except looking out at the pouring rain. If you live in Gothenburg, you live with a lot of rain, so I knew this would be sure to happen again. I love photo walks and Drink-and-Click, but those are mostly about street photo. I wanted something that would let me develop my other interests, ranging from portraiture, to trick photography, to macro, and other things. And, I wanted to be warm and cozy, even if it did rain. From the first photo meet up: The magical diamond. For the first meeting I brought a "diamond". 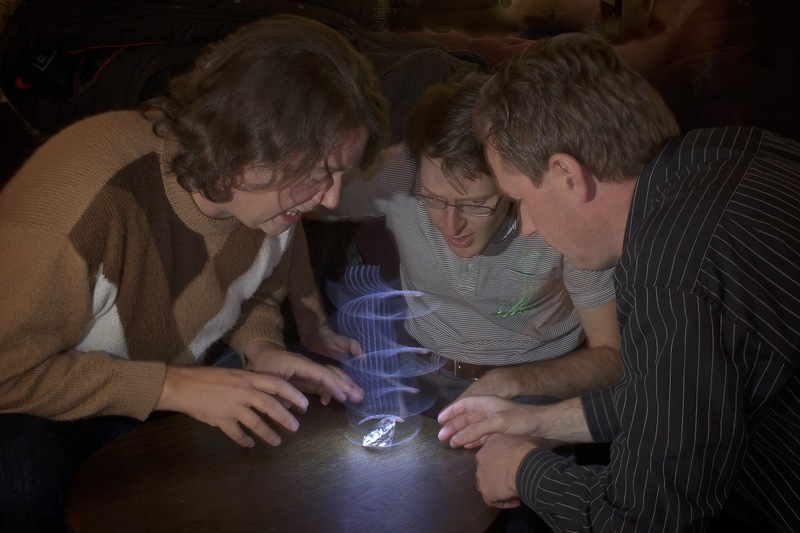 The task was to take a photo of the diamond emitting a magical field of force. At the second photography meet up, the themes were ghosts, and photography books. the meet up was at Condeco, a café in Gothenburg to talk, have coffee, and experiment with photography. Like the first time, the experimenting with photography part soon took over. Who has time for coffee, when there are things to shoot? 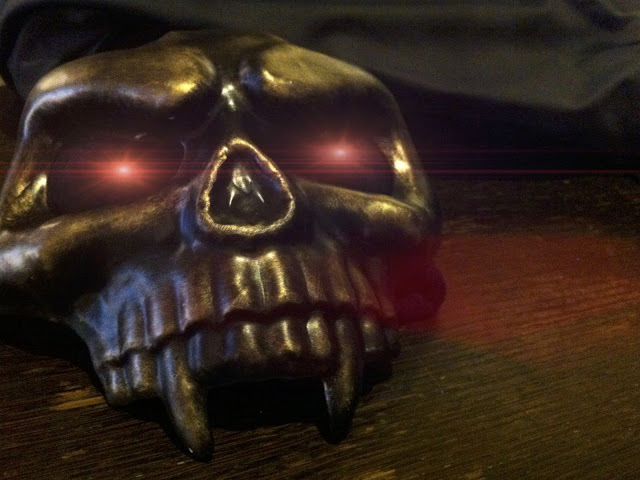 Just a couple of hours before the shoot I went to a party store and bought a cheap skull mask. 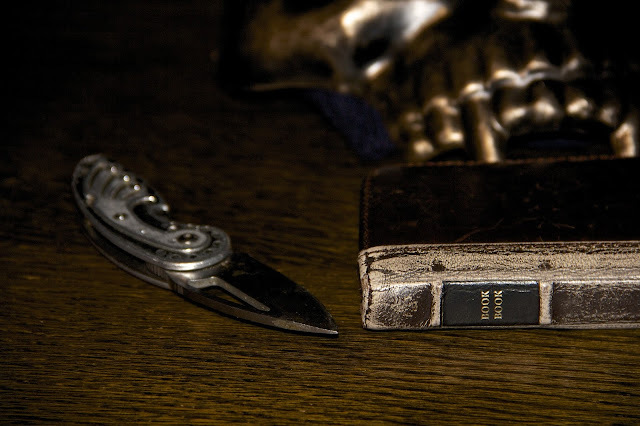 A quick inventory among us yielded a few interesting objects: a knife and a book shaped phone shell. Getting in close often makes a photo more interesting by hiding parts of objects. It also reduces the depth of field. The skull mask is a lot more interesting because it is out of focus and only partially visible. The flash was set to -3 EV. I wanted the flash to help the ambient light along a bit, not overpower it. I used a speed grid on the flash to avoid light spilling where I did not want it. These get togethers are a bit like Open Space sessions at conferences: Anyone can come up with an idea. If people like it, we'll do it, if they don't, we won't. The group can work together, or split off in smaller teams that do entirely different things. We are there to learn and have fun. As long as we do that, what we do, and who takes the lead, does not matter. This photo was shot with my iPhone 4 and the Lenslight app from Brainfever Media. I took it to show that you do not need a DSLR to be in on the fun. It's like a photo walk, except without the walking. Of course a DSLR and a ton of gear can be useful, but you do not need it. A camera phone is good enough. It is not about the gear you buy, it's about the gear between your ears: Imagination, a sense of humor, and a learning mindset is all you need. Actually, you do not even need a camera. We want to get in touch with models, MUAs, cosplayers, lighting experts, stylists, and other people who would enjoy creating stuff together. After the second meeting, I created a Facebook group to make it easier for interested people to keep in touch. Until now, we have posted our photos in the events created for the meet ups. By posting to the group instead, we can make a more permanent record of the things we do. I am working on a photo book, and some of the photos from these events will almost certainly work their way in. If you live in the Gothenburg area, you are welcome to join up. If you do not, why not create a local group? If you do, get in touch with me on Facebook or Google+, so we can link up the groups and exchange ideas and photo themes.